Providing specialized care by treating the root cause of the tailbone pain. Our unique and effective procedure focuses on the SacroCoccygeal joint and restoring normal motion. This alternative to surgery has successfully helped thousands of patients get back to doing what they love! A non-surgical coccyx treatment focusing on stretching the injured tailbone and the surrounding tight muscles to correct tailbone motion, increase function, and decrease coccyx pain. Unsure if your injured or fractured tailbone could be treated? Fill out our History & Symptom form and send it to Dr. Posl for review. She will then contact you to discuss your treatment options and answer any questions that you may have. Direct force on the tailbone may cause misalignment, sprain, or in rare cases, fracturing of the coccyx. A fall can also sprain the surrounding ligaments and strain the muscles. This can cause severe pain, which can last for many years if not properly treated. As the baby passes through the birth canal, it comes in contact with the tailbone. It is possible to injure the tailbone in cases where the coccyx is tilted forward into the birth canal (from a past injury) or if the baby is larger in size. The position of the coccyx can decrease the diameter of the birth canal, which may cause difficult deliveries and lead to re-injury with subsequent pregnancies. For females, it is important to fix past coccyx injuries in order to reduce the chances of re-injury if they give birth again. Children are frequently falling on their hind ends. These falls can cause injury to the tailbone. Many adults present with tailbone injuries with no known cause. These cases may be a flare up of a childhood injury that was irritated by numerous incidents including gaining weight, giving birth, or siting long periods at a desk job. Sitting puts pressure on the tailbone. In cases where people start new desk jobs or have to sit for longer periods of time, it adds extra pressure to the tailbone and its supporting tissues which may then become painful. Don’t let the distance get in the way of your treatment. Although our clinic is located in Eden Prairie, MN, Dr. Laura treats patients from all corners of the United States. The full treatment can be completed within 3 – 5 days, depending on the severity of your case. Surgery to remove the tailbone (Coccygectomy) can be a very long, painful, and costly experience. Our alternative method is quick, effective and inexpensive compared to surgery. The actual adjustment only takes around 60 seconds. We combine the coccyx adjustment with deep tissue muscle massage and assisted stretches to address the joint and surrounding muscles, in order to get you the best possible results. The majority of our patients have recorded considerable improvement in their pain levels and range of motion in the days and months following our treatment. Each procedure typically improves coccygeal motion by 20-30%. Once measurable motion has been restored, most people feel as though years of strain have been removed from their spines. Reports of improved spine and pelvic flexibility, reduced pain and greater strength are routine. 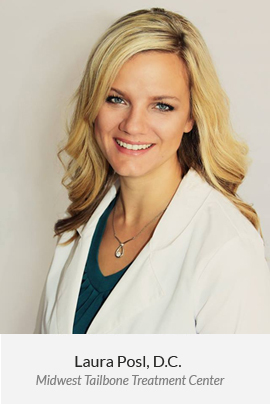 Dr. Laura Posl attended Minnesota State University, Mankato in the registered nursing program, while obtaining her prerequisites for chiropractic graduate school. She was then accepted into Northwestern Health Sciences University in Bloomington, MN where she received her Doctorate of Chiropractic and a B.A. in Human Biology. She furthered her coccyx (tailbone) knowledge studying under Dr. Chris Kemper, a pioneer in this specialty. Dr. Posl is the only female currently trained in the Wooley-Kemper procedure..